The treatment of your windows has a tremendous effect on the interior and outdoor space of your home. Shutters are a simple addition that brings about a set of benefits such as added privacy, protection, and curb appeal to an otherwise regular home. Shutters have actually been around for hundreds of years. They were originally used inside of homes before glass was made available to the general public. They were used to keep light in or out, keep outside and inside noise at bay, added for privacy, and to protect the home from the elements of the environment. When glass became available, as well as other modern materials and technology, shutters lost their popularity and soon became a charming decorative detail to classic and traditional homes. Whether you’re thinking about adding shutters for function or decoration, there are important things you need to consider before you add these charming window treatments to your home. Does your house have a Victorian style? Or does it have an Asian style? Or maybe your house is modern and contemporary? Before you even consider adding shutters to your home, decide whether or not if they’ll actually match the style of your home. Victorian, colonial, and traditional houses are most ideal for shutters, especially exterior shutters that look extremely appealing. Modern homes can also utilize exterior shutters, but customized with a modern touch. With shutters, depending on the size and shape of your windows, you may need multiple panels, which is why it is beneficial to have a trained expert assist you with your design and installation. 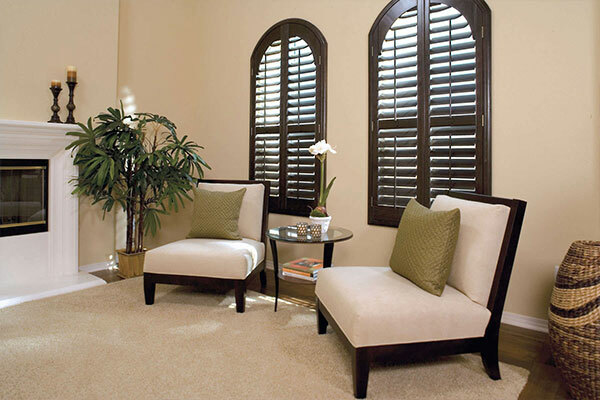 Wood shutters are often used when a stained wood design is required to match interior furniture or outside curb appeal. The typical cost of wood can be higher than composite or vinyl, but the appearance can be well worth the investment. Composite shutters are often the most popular shutters used in Las Vegas homes due to the lighter colors, quality and optional stain colors. Composite shutters tend to cost less than wood shutters and are made to be of equal quality and longevity unlike vinyl shutters which are made to be inexpensive, and are not considered an industry standard due to lack of quality, appearance and lifespan. Ideally, the color of your shutters should match the color of your main door. Generally white shutters are the most common and affordable, but custom options such as stained wood are available. Styling varies depending on wood and color. The style depends on the architecture and general atmosphere of your home. Louvered shutters are great for Victorian style houses, while solid or paneled ones are great for colonial style houses. Panel styling can vary depending on the width of the shutter. In terms of price, shutters cost the same regardless of the style of casing or louvers (window casing is the frame outside the window). Shutters are a fantastic way to add value to your home – they add that vintage and charming look that will absolutely turn heads on the street. When it comes to having shutters installed you need to make sure to choose a reputable company who uses a national product line that has been proven to withstand the test of time.